Hillsboro’s Emma Birkhimer fields the ball in left field on Tuesday at Shaffer Park where the Lady Indians took on the Lady Broncos of Western Brown. 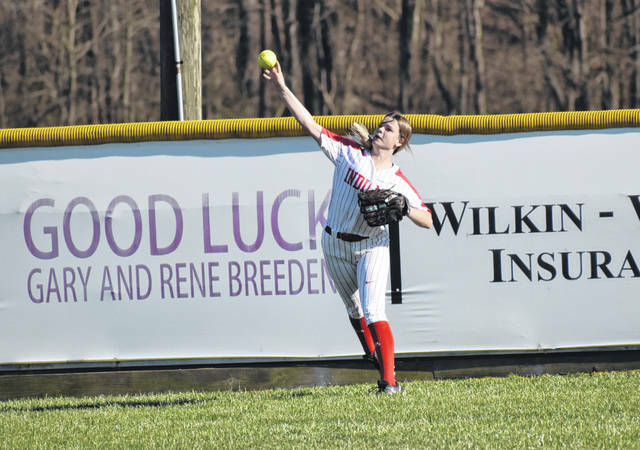 The Hillsboro Lady Indians varsity Softball team hosted the Western Brown Lady Broncos at Shaffer Park in Hillsboro on Tuesday and fell to the visitors in five innings by a final score of 11-0. Hillsboro did not register a hit in the game and was unable to reach the base paths at all against the Lady Broncos. Gracey Dearmon got the start for the Lady Indians and pitched three innings against Western Brown as she faced 18 batters and allowed eight hits. Dearmon also allowed 11 runs, two earned, and walked five batters while striking out one and hitting another in her three innings of work. Zoe Grove entered the game in the top of the fourth inning in relief of Dearmon and pitched the final two innings. Grove walked four batters, including three consecutive batters in the top of the fourth, allowed a single and struck out one while the defense behind her made the necessary plays and kept the Lady Broncos off the scoreboard over the final two innings. Western Brown scored one run in the top of the first inning and three in the top of the second inning to take a 4-0 lead into the third inning. In the top of the third the Lady Broncos sent 12 batters to the plate, registered four hits and scored their final seven runs of the game. Hillsboro Head Coach Katie Moberly knew that her team would be challenged against the Lady Broncos and was proud of the effort that her team displayed in the game despite the lopsided score. The Lady Indians will be back in action this evening when they travel to Washington High School to take on the Lady Blue Lions in a Frontier Athletic Conference matchup. https://www.timesgazette.com/wp-content/uploads/sites/33/2019/04/web1_Emma-Birkhimer-HHS-Softball-vs-Western-Brown-2019.jpgHillsboro’s Emma Birkhimer fields the ball in left field on Tuesday at Shaffer Park where the Lady Indians took on the Lady Broncos of Western Brown.